I am mildly protan colorblind. I have trouble distinguishing some reds from greens. I cannot successfully pick out all of the numbers hidden in those funny figures with the many little dots. 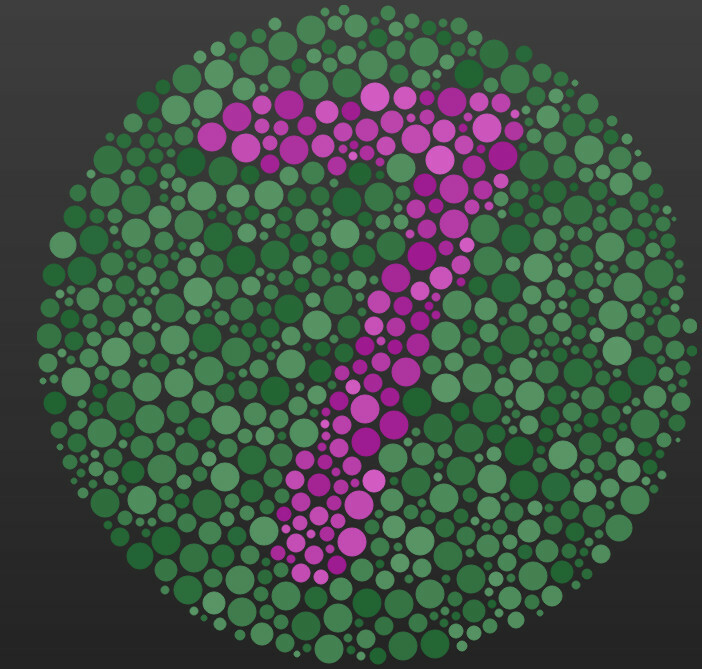 Here is an example of one of them from the EnChroma Color Blindness Test. Many years ago, when I was working at the aerospace company, TRW, various games would become lunchtime fads for a while. I am not talking about serious ones like bridge or chess, games that require heavy mental lifting, but simplier ones like hearts or kriegspiel. Enough of a challenge to play well, but not brain exhausting. There was enough of that in the rest of the day. As most of you probably know, hearts is a trick taking game for which the object is not to take points. Each heart counted one point against you and the queen of spades thirteen. During the course of play, for every hand, usually everyone was pegged with a few hearts. But the card certainly to avoid was the evil queen. I remember one lunch hour in particular in which I was really getting hammered. I ate the queen many more times than was my share. I could not understand what was happening. Was I having an extremely bad day for luck, had my game suddenly gone to pot, or what? After the game concluded – I reached a score of over 100 and end of game – in rapid fashion, the other players explained what was going on. As is the custom with many card games, two decks are used. While the cards were being dealt out from one for a new hand, the other one is being shuffled. No time is wasted at the end of the hand. The next could start immediately. The two decks we were playing with both had the same abstract design on the back. The only difference between them was that one back was green and the other one brown. There is a lot of red in brown. I could not tell the difference. Before we began for the day, my erstwhile friends merely swapped the queen of spades between the two decks. Then everyone could see where the queen of spades was at all times in either deck. Everyone could except for one person—me. This turned out to be a tremendous advantage. Talk about ‘marked’ cards. This was ridiculous! If I held the queen, it would be ‘smoked out’ of me. Low spades were led until I was forced to play it, winning the trick, and eating the big points. If someone else held the queen, then his buddies held off, not leading spades at all. So the moral of the story is to take the color blindness test. And if you have a deficiency, stay away from cards games with two decks being used – two decks that you cannot tell apart.